Tang and I had a lot of fun. Thank you, Jeff! 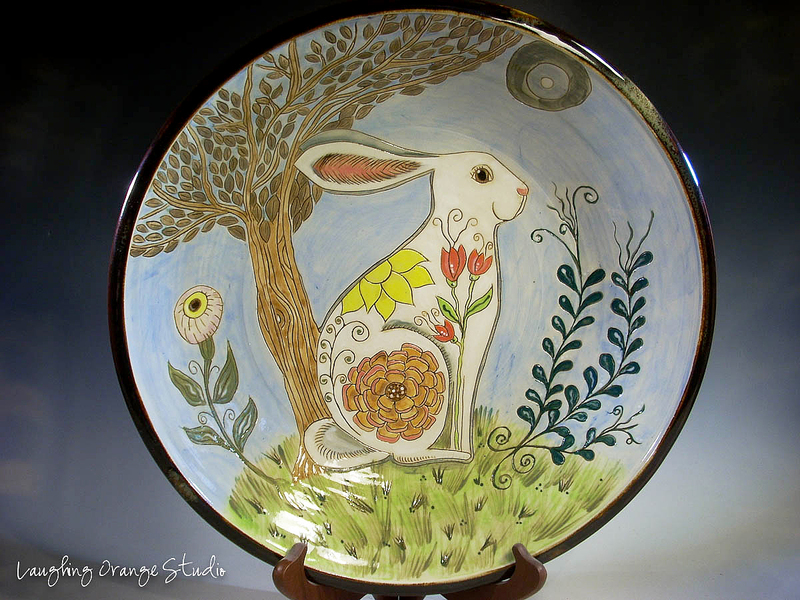 We are so excited this year to have added two potters to our Holiday Open Studio Tour for a total of 5 different locations where you can shop and visit with the artists. 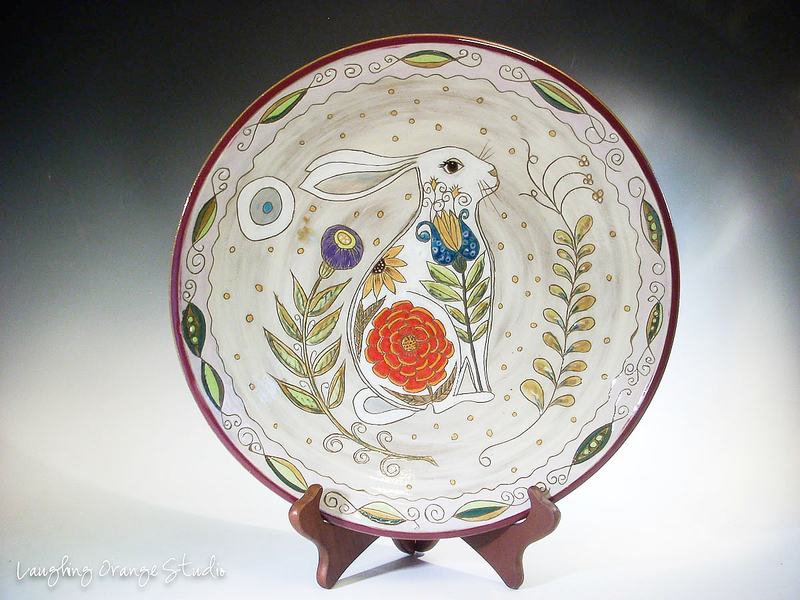 Barbarah Robertson and Chickadee’s Artist Gallery and Pottery Shop have agreed to be a part of this annual event and are helping to round out a county wide tour. At the northern end of Shenandoah County, Liz Ashe-Hollingsworth with be showing and selling her lovely Earth Spirit Masks. 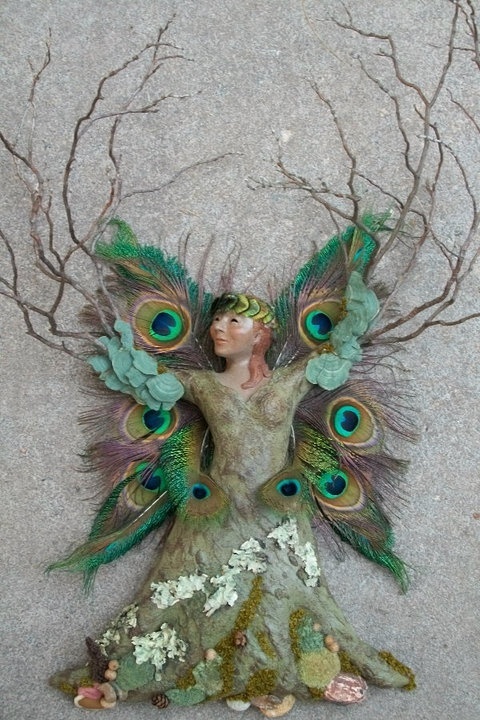 “Magical one of a kind clay sculptures depicting nature spirits, faeries and animals enhanced with found natural objects.” You truly have to see these items in person to see just how awesome they are and the work that goes into these to make them so wonderful and magical. dening store. Selling organic gardening supplies, lights, hydropoics, tools and more! A fun place to visit if you enjoy gardening and food preparation. What a great combo to find handmade and organic items. Laughing Orange Studio is in the middle of the county, in Tom’s Brook where I have a few new items and the usual rabbit items and fairy garden items. I have been working on some cupcake cups, some cookie jars and the trays and mugs that I usually have on hand. A new outhouse design for the fairy garden or a wheel barrow or even a fairy ring might be just the thing for the fairy gardener in your life or on your list. wine cups and more. 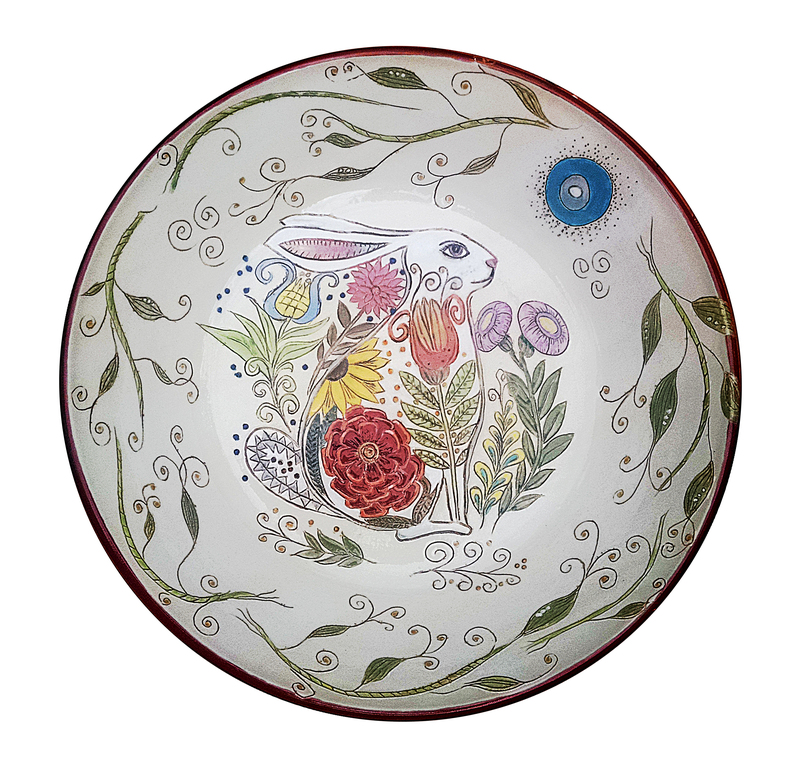 Her glazes and nature inspired designs add to the elegance of the porcelain and it makes having a cup of coffee or a snack an experience rather than an everyday occurrence. 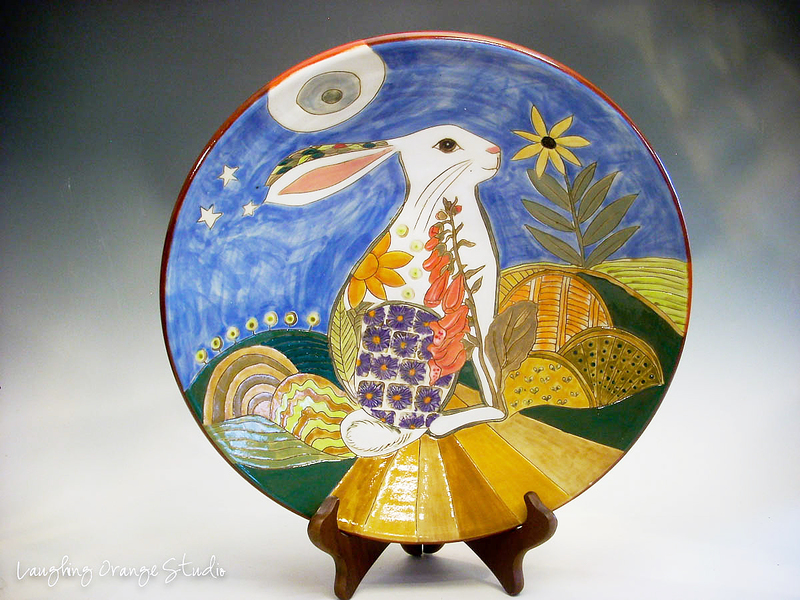 Our southern most site will be the new pottery in New Market called Chickadee’s Artist Gallery and Pottery Shop. 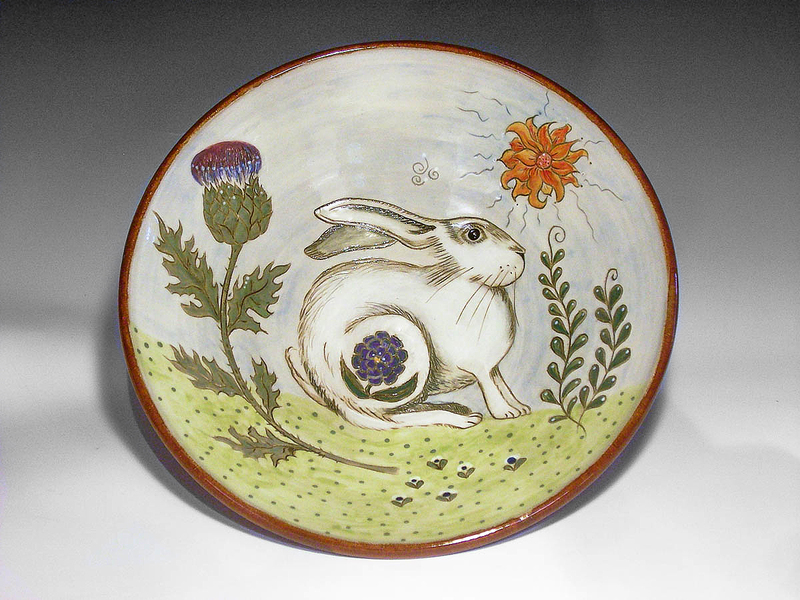 Chris and George Jetter are the owners of this lovely Local Artist Gallery and Pottery Shop. The shop offers a wide variety of locally crafted items such as Pottery, Quilts, Blown Glass, Glass beads, Soy Candles, Digital and Film Photography, and much more! 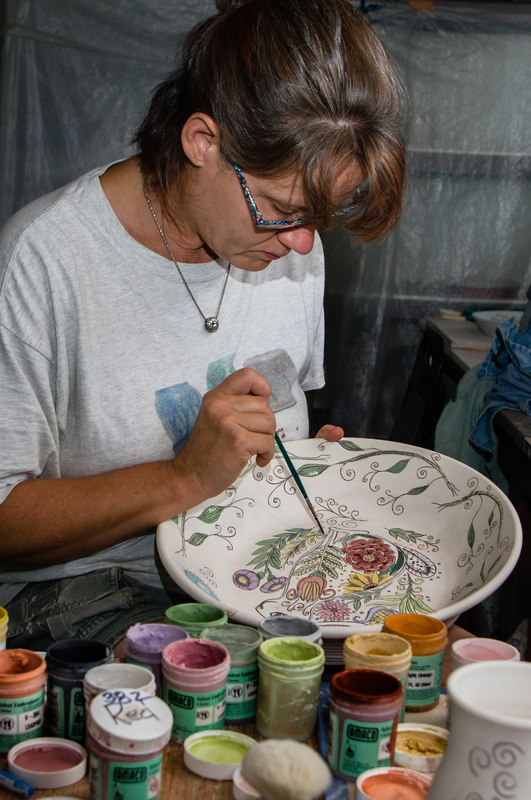 All pottery sold from Chickadees is created on site! You can even get a behind the scenes look at the craft of pottery by attending a live demonstration from George himself! Postcards are going in the mail this week but be sure and mark your calendar if you are only on this newsletter list so that you come to this special event and take home some items for the holiday season to use during your own celebrations or to shop for that special person that is so hard to buy for. 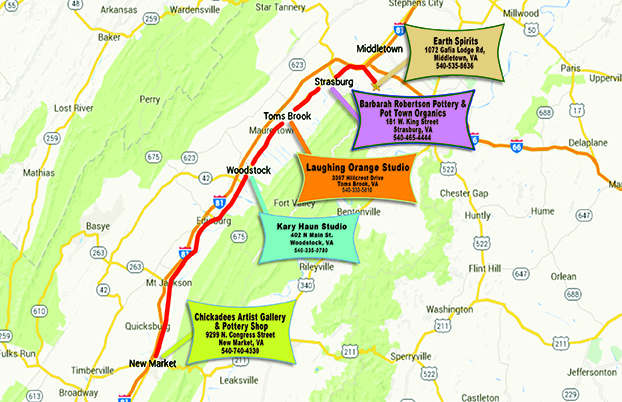 Be sure to follow the Holiday Open Studio Tour on Facebook because each of the five artists will be posting the progress of the work that we are preparing for this event and you will enjoy watching from there. This annual event will be held on Friday November 20th from 5:30-7:30 at the Central High School Cafeteria, in Woodstock, VA. 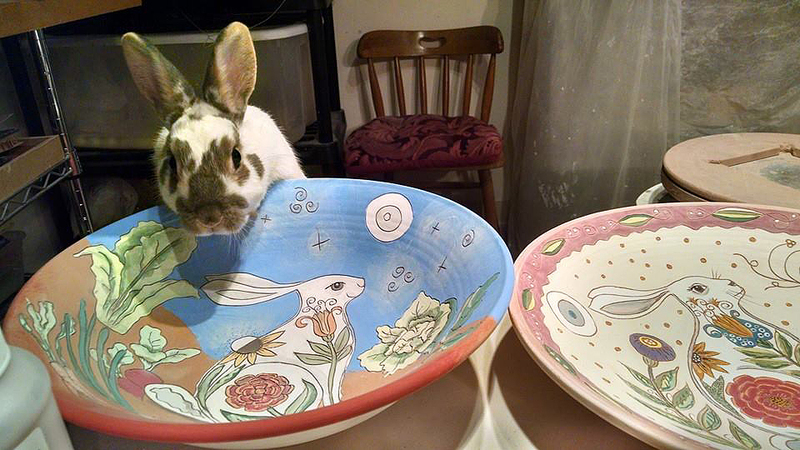 This will be the fourth year that I have donated bowls. I love doing this because I know that it is for a great cause. Food is something that many of us take for granted and I know that there are plenty of folks out there that aren’t getting enough to eat. The Alliance for Shelter helps many of those who are in need in many ways. For the first time this year, you can purchase your tickets on-line by visiting their website at www.allianceforshelter.org and clicking on Empty Bowl Soup Supper. Tickets can also be purchased at Woodstock Cafe in Woodstock, Sager Real Estate in Strasburg, Edinburg Mill in Edinburg, and Community Store in Basye, or reserve your tickets by calling Shenandoah Alliance for Shelter at 540-459-3212 or 540-459-8395. Tickets are limited to 300, so reserve your tickets early. Tickets went on sale October 1, 2015. I have pledged 30 bowls this year. 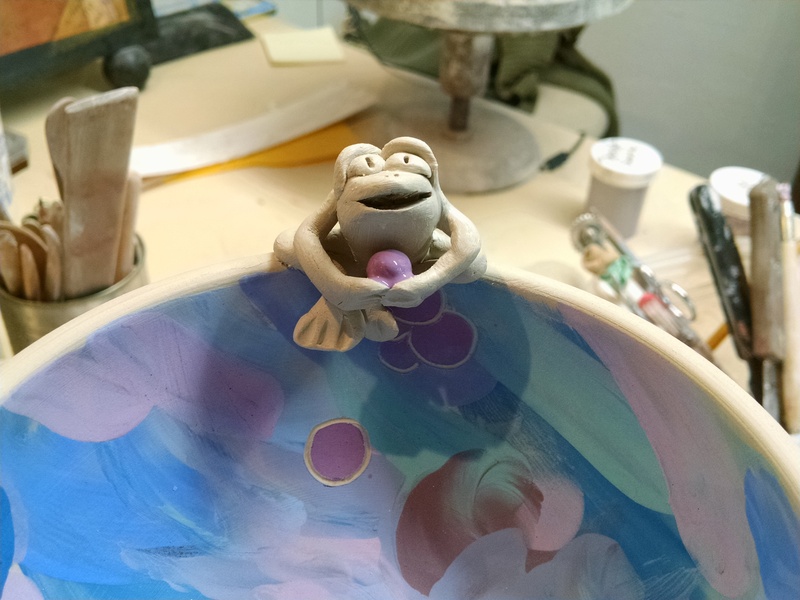 Each bowl will have my signature frogs on them full of their personality, and a little of mine, hopefully! 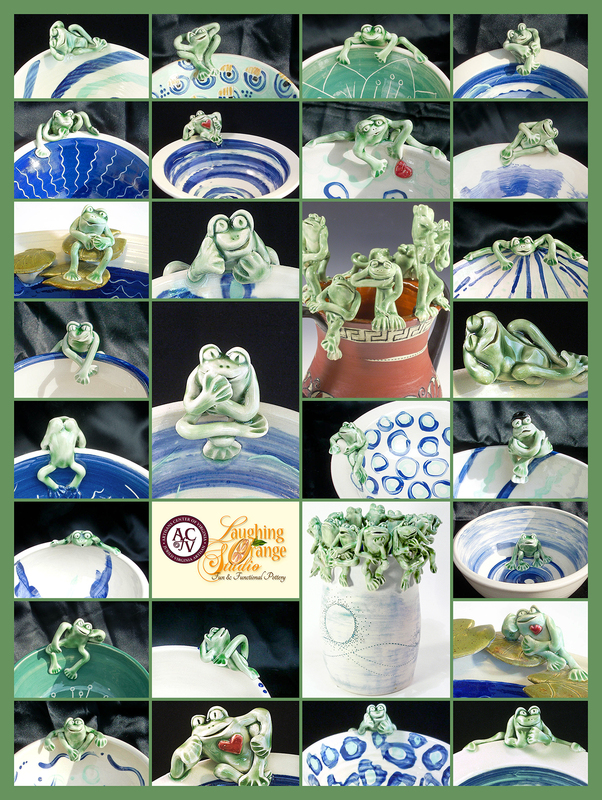 Also this year, I have had help with making my bowls and I would like to give a shout out to Kara Bowman and Ali Carithers and Patricia Wolfe for their help with adding glazes to the bowls, trying their hands at making a few of the frogs and to learning how much goes into making the bowls for the dinner. I love making these and these ladies all understand the importance of doing something for the community. I’d like to thank them for their help and also for the fun we shared doing the bowls. Tang continues to make me smile as I work in my studio daily. She can be grumpy somedays, curious most days and sleepy when she gets warm. 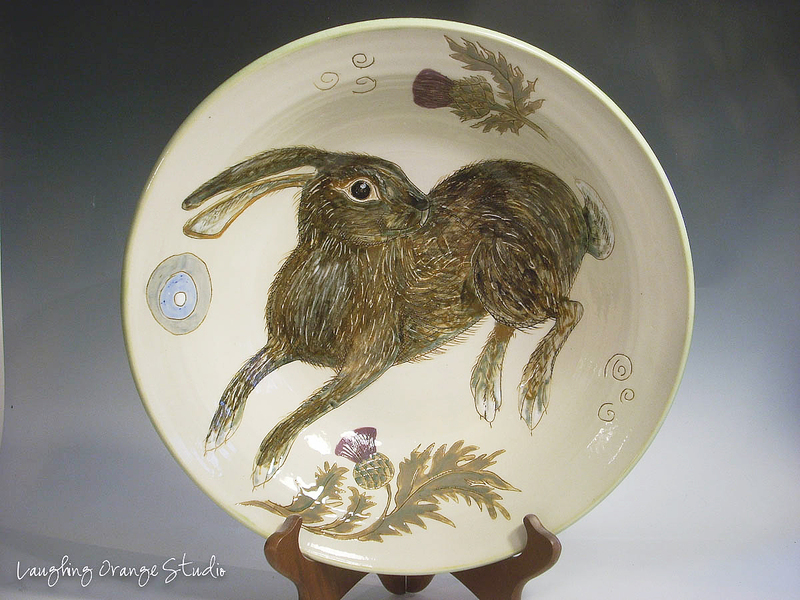 When you come to the studio to see me or my work, stop in and see how soft she is and how much fun it is to have a rabbit as a pet and inspiration. 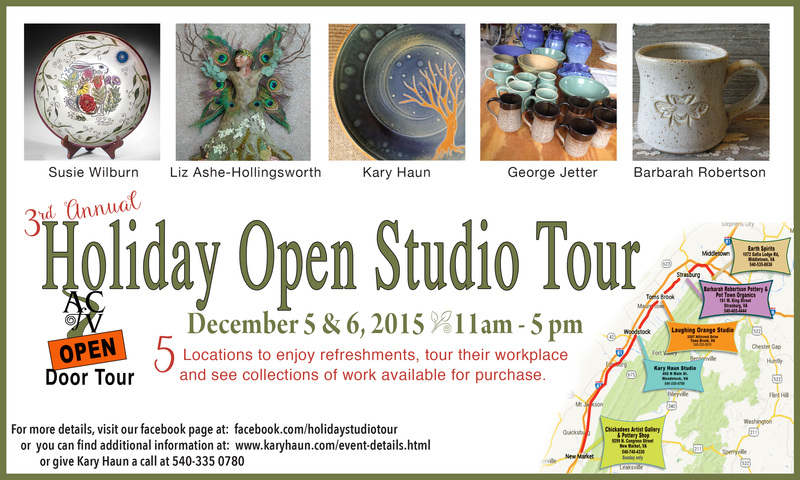 and the Holiday Studio Tour to see the fun as it is being created. Today, I am killing two birds with one stone. 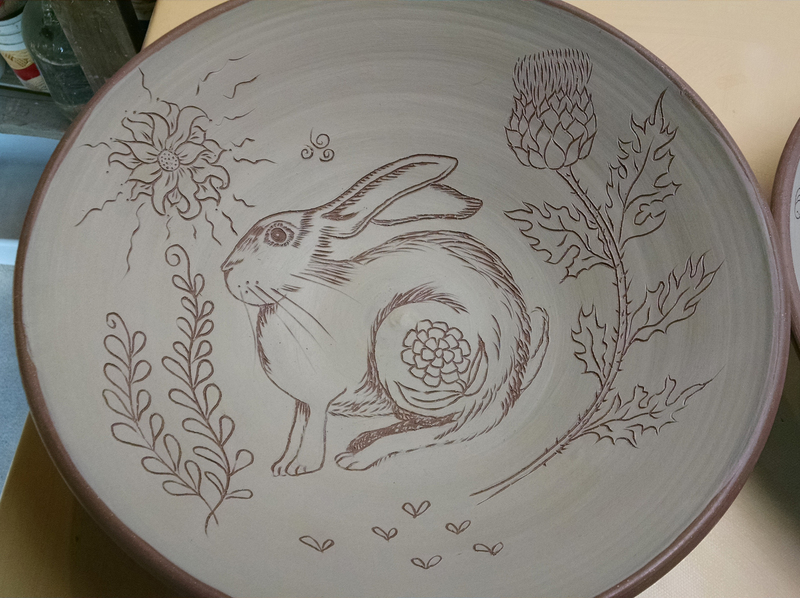 I threw 4 really large pasta bowls this week and needed to decorate them so today my drawing was in clay and is on two of the four large bowls. 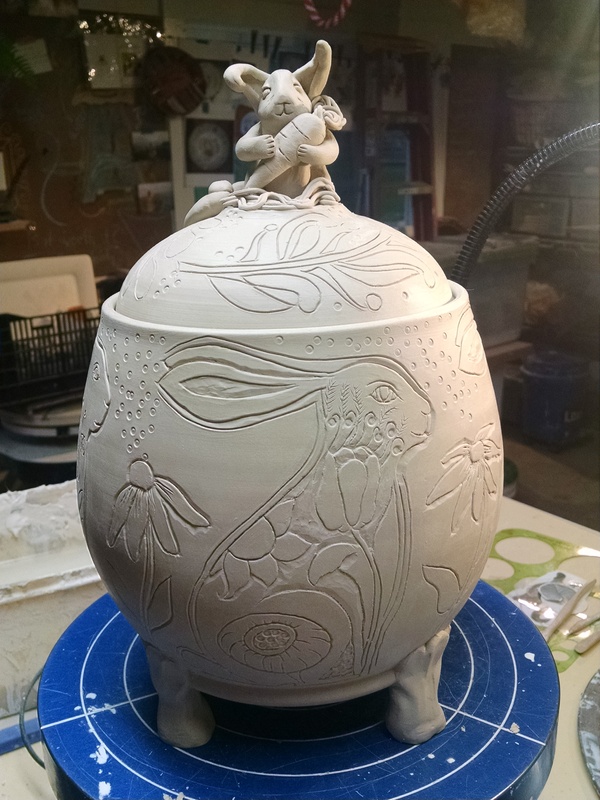 I am also posting a finished one from last year so that you can see a similar bowl in the final stage. Enjoy! I have a couple of Facebook friends who post the phrase “rabbit, rabbit, rabbit” on the first day of every month. According to wikipedia, this phrase should be the first words out of your mouth on the first day of the month for 31 days of good luck. 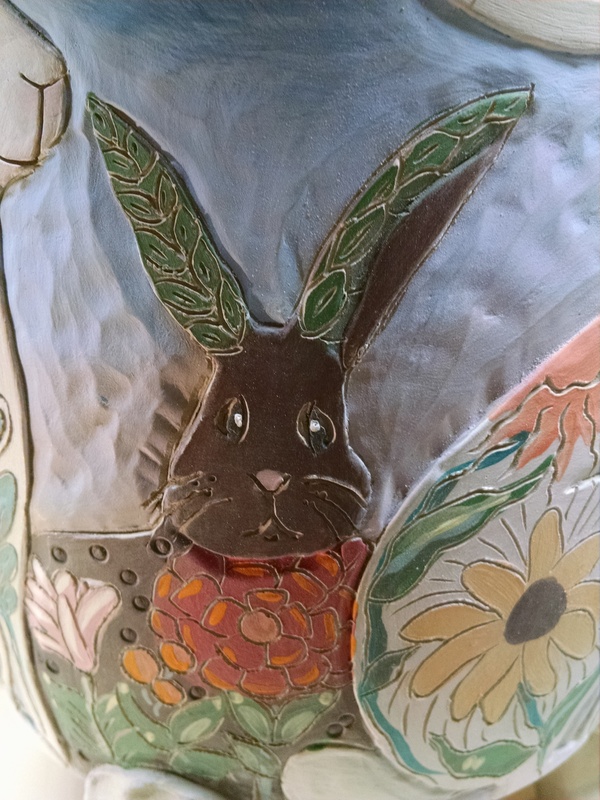 I know it is just a silly superstition but I think it is fun, given that I have been doing a lot of rabbit themed work. 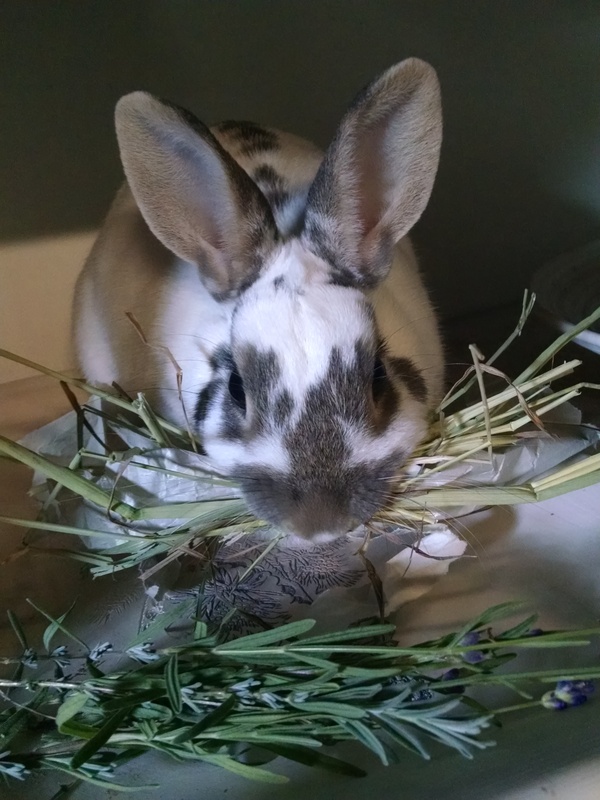 And of course, back in the fall, I got a pet rabbit to have in the studio to keep me company and bring me smiles. I named her Tang, like the space drink because it is an orange theme name to go along with my Laughing Orange Studio theme. 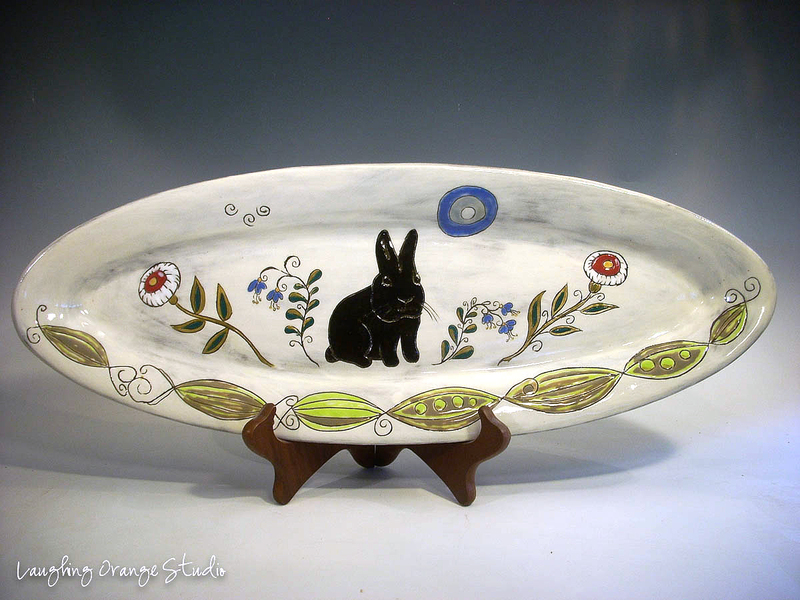 Last summer I started trying to throw much larger pieces and ended up with some rather large plate/bowl forms. 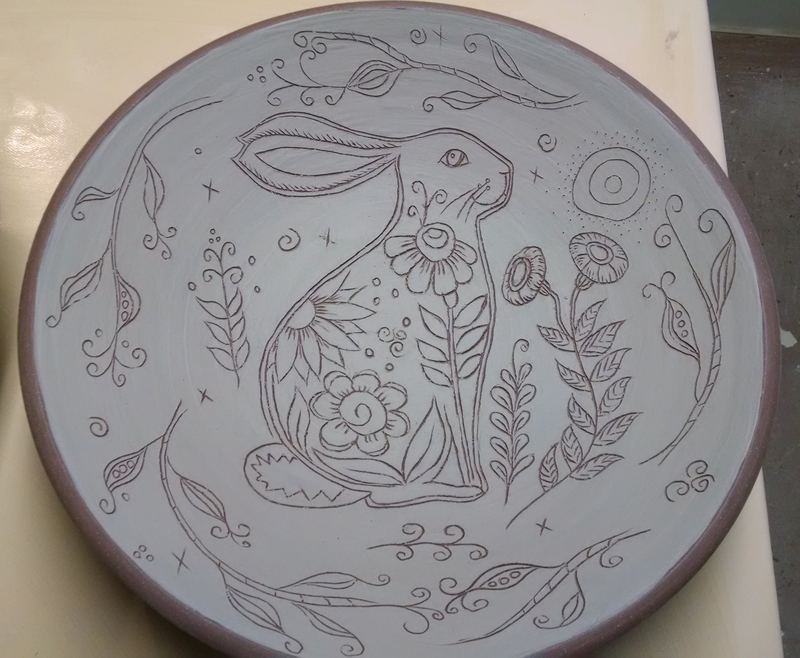 I decided to decorate them with my rabbit theme and add variations of gardens, trees, and flowers. So, I thought I would share some of these pasta bowls here. The first of the month is in a few days so be sure and rise out of bed and let your first words be, “rabbit, rabbit, rabbit”.